We bought some fillet steak from Tesco, coated it with crushed black peppercorns and barbecued it medium rare. A tasty and tender piece of meat that we served with chips and tomatoes. Some food and wine matching experts recommend pairing steak with Beaujolais Crus. 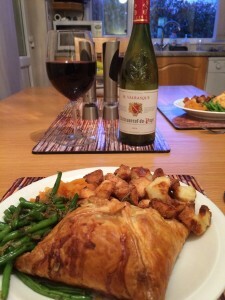 We opened a bottle of Brouilly Domaine Demiane 2011, a Beaujolais Cru from the Wine Society. Teresa is not a great fan of Beaujolais and felt it tasted too perfumed for her. I enjoyed its smooth red fruit flavours and thought it a good match with the steak. However, neither of us are really into Beaujolais. We enjoyed an old favourite tonight – the Supercook Coq au Vin recipe. However, Teresa did not have any smoked bacon, so she modified the recipe with some chorizo. Whilst it was still very tasty, the chorizo tended to dominate somewhat. Kathryn McWhirter and Charles Metcalfe in the Sainsbury’s Pocket Food and Wine Guide suggest a Beaujolais Cru or an Australian Shiraz/Cabernet go particularly well with Coq au Vin. We decided to open a bottle of each and compare. 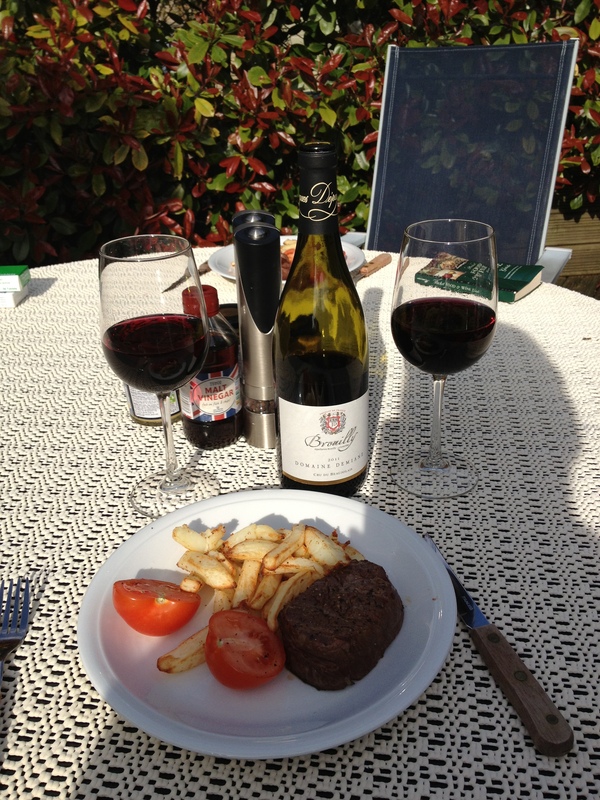 We last drank Terre des Lys Fleurie 2009 from Costco on 23rd November 2011 with Roast Beef. This time we found its raspberry flavours pleasant with the Chicken, but not very exciting. The second bottle we tried was ARH Family Shiraz/Cabernet Sauvignon 2009, a Sunday Times Wine Club red from Australia. We found it smooth with black fruits, with a vanilla sweetness and spicy finish that went well with the chorizo in the stew. A very good match. 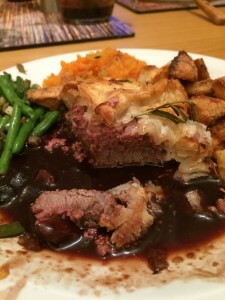 For a midweek meal we had Korsakov Meat and Potato Pie from Supercook. This is of Russian origin and contains minced beef, potatoes, mushrooms and Cheddar cheese. It is lightly flavoured and would be easily overwhelmed by a powerful wine. We considered something light like a Beaujolais would be appropriate. We have indicated in previous posts that these reds have generally not impressed us in the past. However, we had only tried Beaujolais Villages rather than any of the Crus. We had recently bought a case of Terre des Lys Fleurie 2009 from Costco so opened a bottle. The first thing we noted was that the wine was a more intense deeper red in the glass. It had distinct cherry aromas, which carried through to the palate. The wine was mellow and untannic and a good match with the meal. It was nice to have plain roast pork for a change. While either red or white wines can provide good matches, we fancied a red. 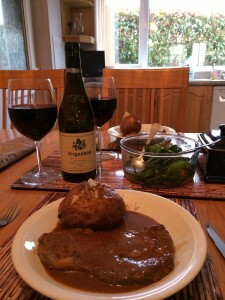 Previously we have tried Pinot Noir with Roast Pork, but thought we could have done better (see Sun 10th April 2011). This time we decided on a Beaujolais – Georges Duboeuf Beaujolais Villages 2008 from Costco. Teresa is rarely impressed by Beaujolais. She finds them too light and sharp for her taste. I thought the wine was smooth with plum and strawberry flavours and was a pleasant match with the pork. You will not have noticed too many barbecue food and wine pairing blogs here recently. The great British summer has put paid to that. However, today it managed a sunny and warm day, so we used our new barbie for the third time! We had some sirloin steak and saw a Thai Beef Salad recipe in The Great Barbecue Cookbook (Ted Smart) that looked interesting. The steak is barbecued, sliced then tossed with lemongrass, spring onions, fish sauce, lime juice, chillies and coriander. With this mixture of flavours, choosing a suitable wine was challenging. We tried a white first – Stumble Vineyards Chenin Viognier 2009, a South African white from Sunday Times Wine Club. Chenin Blanc can work well with lime flavours and we’ve had successful pairings in the past with Thai food. Not this time though. The steak flavours did the wine no favours. Our Plan B was a bottle of Georges Duboeuf Beaujolais Villages 2008 from Costco. We have not had much success in finding good pairings for this wine so far, but I had read that Beaujolais is one of the few reds that can cope with Thai food. It is also recommended by some as a good partner for plain steak. Anyway, we were both pleasantly surprised. The Thai Beef Salad brought out some lovely savoury, earthy, fruity flavours in the wine, which also managed to meet the acidity in the sauce. We had a traditional Sunday roast for the first time in a while. Roast Beef, Yorkshire Pudding, etc. Some say Rioja goes well, others Shiraz, or a New World Cabernet Sauvignon. Traditionalists recommend mature red Bordeaux. At the other extreme, there are some who would go for a Beujolais Cru. We opened one of Tony Laithwaite’s own Bordeaux creations Le Grand Chai Medoc 2005 from the Sunday Times Wine Club. Described as complex with blackcurrant, plum and cassis fruit flavours and a firm, smoky oak structure. It was a reasonable match, but not that exciting. We have a second bottle that we will try possibly with some Roast lamb next time. We had more of the home-made beef stew from the previous evening and decided to open a bottle of Ogio French Merlot/Shiraz 2009 from Tesco. We took a couple of mouthfuls and both decided it didn’t go with the stew. There was an Isla Negra Merlot Reserva 2010 also from Tesco to hand, so we tried this instead. This was a definite improvement, but not a stunning match. Whilst an Australian big red made a good match with this stew the previous evening, generally we are finding lighter beef stews far more difficult to match with the heavier reds than richer red wine-based dishes. We think lighter European reds are usually a better bet with the less weighty stews and casseroles.